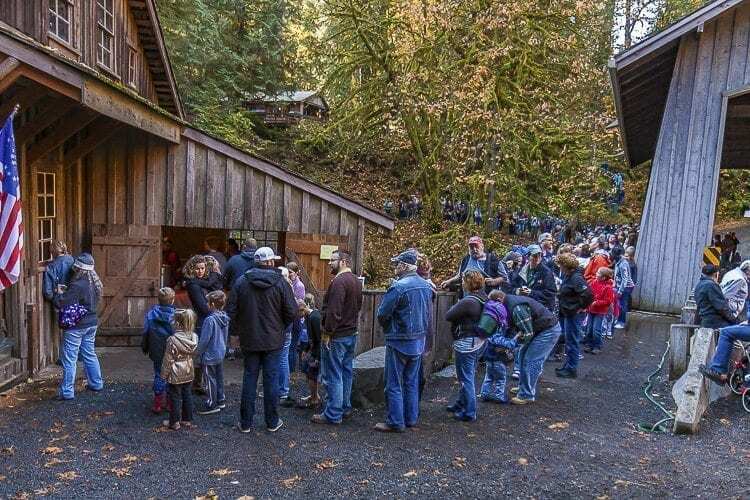 WOODLAND — The sounds of the churning waters of Cedar Creek mingled with the murmur of crowds and old fashioned machinery as visitors flocked to the Cedar Creek Grist Mill on Saturday for the mill’s annual apple cider pressing. 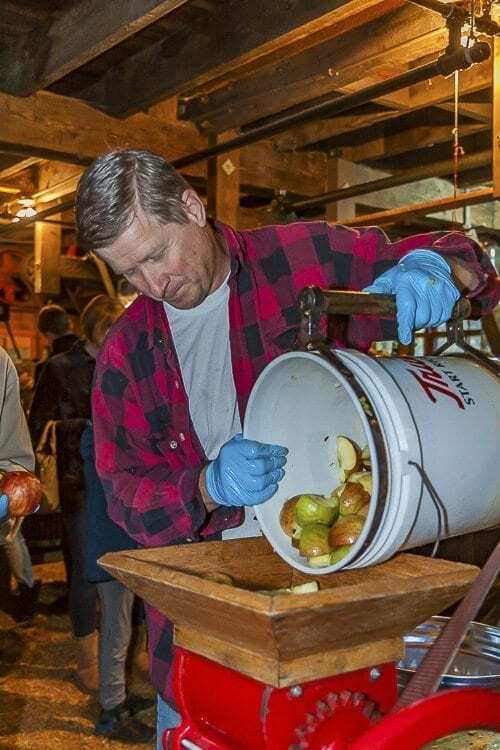 The apple cider pressing at the grist mill offered visitors a chance not only to see the historic mill itself, but to also watch and take part in the making of apple cider in an old fashioned manner. The event began at 9 a.m., but expectant visitors began arriving long before that to find parking and show up before the crowds. The first thing visitors got to see in the apple cider process was the apple washing process. Volunteers dunked buckets of apples in a water and light bleach mixture to get rid of any contaminants on the fruit. They were then fed through a rotating, belt driven drum powered by an antique International-Harvester engine that scrubbed the apples. 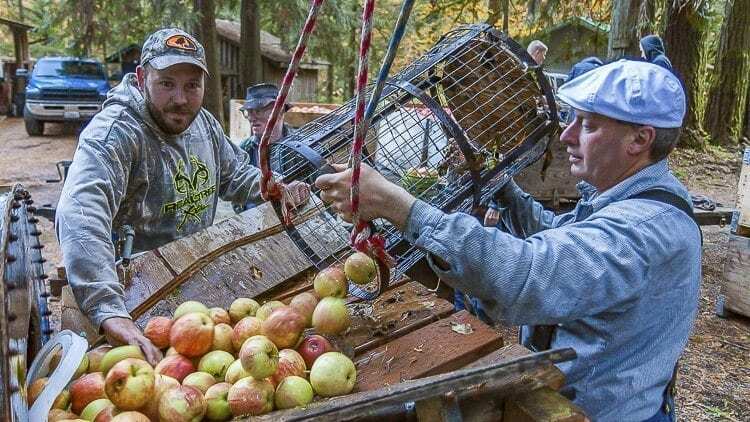 Volunteers loaded apples into garbage cans, and they were taken to the grist mill itself for the next steps in the process. 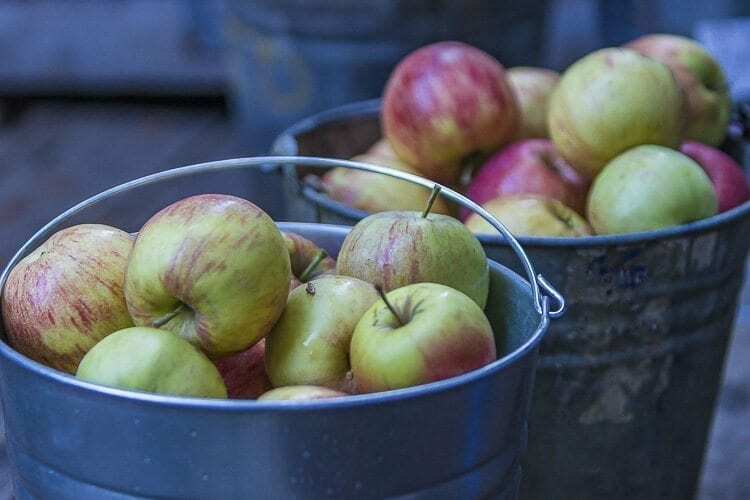 The whole apples were chopped into smaller pieces, and run through a grinding machine that was powered by belts and pulleys driven by the flow of the river. The ground up apples were then placed into a press, where volunteers and visitors then used a large hand screw to squeeze the juice out of the apples. The juice was placed in filtered vats to remove any debris from the apples. 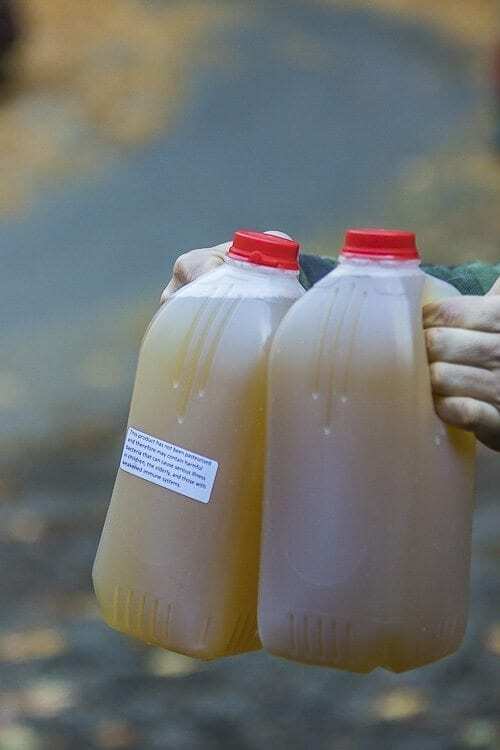 Once filtered, the freshly pressed apple cider was poured into jugs and given to expectant visitors. According to volunteer Jeffrey Berry, the Cedar Creek Grist Mill has been holding annual apple cider pressings for 25 to 30 years. Berry said that the grist mill has approximately 10 volunteers that help staff it year round, and an additional 10 to 15 volunteers help put on the apple cider pressing. 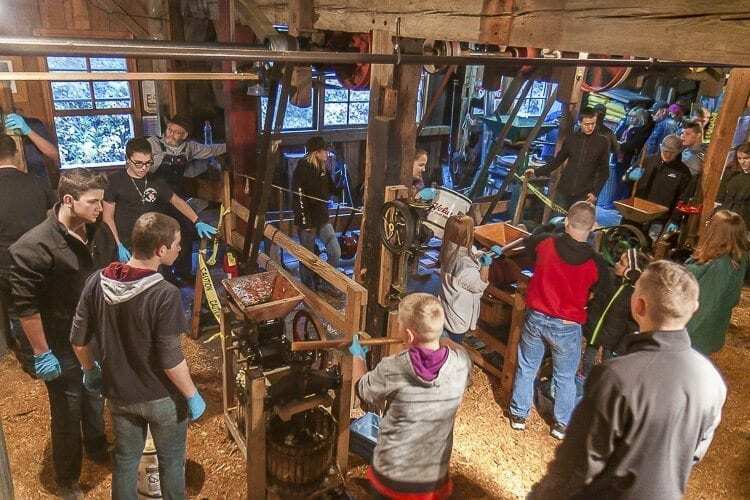 In addition to grist mill volunteers, this was the second year that students from Battle Ground High School’s Air Force ROTC program served as volunteers throughout the cider making process. 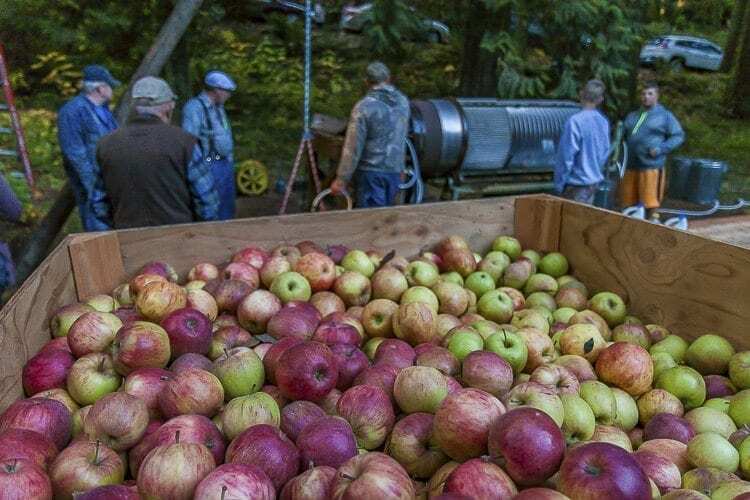 Berry said that the cider pressing day usually consumes 14 large bins of apples, but that this year they only had 12.5 bins due to a fire at the apple distributor plant. 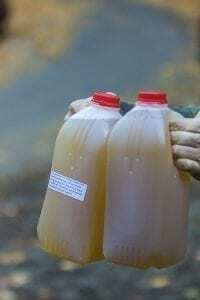 Despite the fall chill, visitors showed up in droves to see firsthand the cider pressing process and to get a jug of the fresh cider to take home. 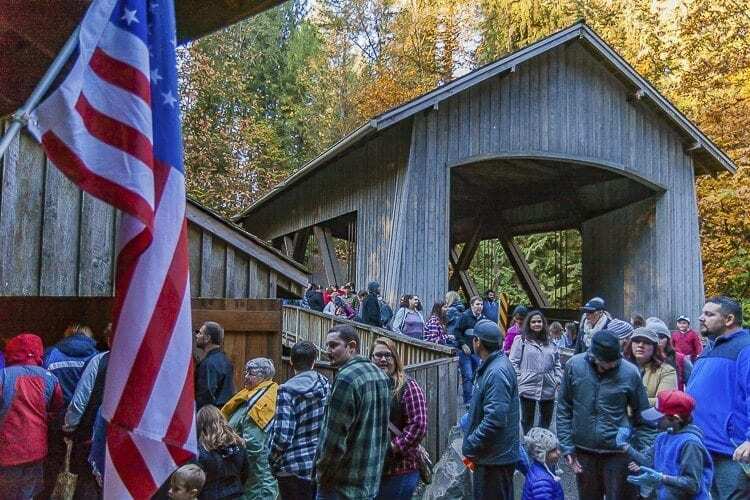 In very little time, a line stretched from the grist mill across the covered bridge over Cedar Creek and wrapped around the opposite bank of the creek, as new arrivals expectantly waited for a jug of cider. Volunteers at the grist mill also told about the history of the mill, and gave demonstrations grinding corn on the mill’s historic grain mill machine that was built in the 1840s and still used today. On the back porch of the mill, visitors listened and danced to live bluegrass music throughout the day. Berry said that this was his seventeenth year volunteering at the grist mill and taking part in the apple cider pressing. He said that it is a family friendly event, and the family oriented atmosphere is one of the best parts of the cider pressing day. For Berry, the best part of the cider pressing is “the kids that I see year after year.” He said that he likes to see children that come with their families to the mill as an annual tradition. More information about the Cedar Creek Grist Mill, as well as events that occur at the mill, can be found online at the mill’s official website.